Through frequent contrasts with Western Europe, Pipes draws the reader down the chronology of the rise of the Russian empire and the forces, internal and external, that shaped its history. For me, this books stands out for the attention it pays to building the foundation for an understanding of Russian culture, from the geographical and climatic conditions, to the Mongol takeover, its legacy, and the presence and quality of the Christian Orthodox church. Rather than presenting history as a series of discrete events, Pipes stresses social, economic, and political connections as it presents a continuous narrative. However, this is a historical text, heavy with detail and tangential asides, shifting from the historical narrative , the etymology of “Russia”, to the manner in which terms like “patrimony”, “despot” and “feudalism” are (and whether they should) be used to refer to the Russian Empire and its organization. The book is not an airplane read, nor is it, despite the dry wit that is occasionally apparent in the narrative, a light piece of nonfiction. I would not recommend this to someone who has no prior interest in either history, Russia, or the Soviet Union. That said, the book is well written, and if you have any interest in Russian history, it is a must read. 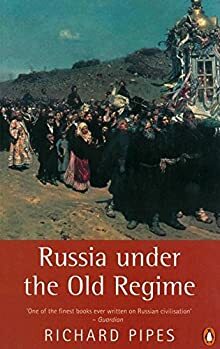 This entry was posted in Book Review, history, non-fiction, Review and tagged book, Book review, books, history, richard pipes, russia, russia under the old regime. Bookmark the permalink.